A complete range of water-based inks and / or solvent 45A Original HP® cartridges, not refilled, for professional printing barcodes, addresses, logos and numbers. Different customers using different types of paper for a virtually infinite range of applications and each requires different features from its ink. Our range of inks suit most applications and are available in standard cartridges or in the new size with a connector able to work in continuous ink tanks called Manifold, saving up to 50% of ink cost. For coated or non-coated stock Complete is a dye/pigment hybrid ink that is formulated to print on both coated and non coated substrates. This ink will dry quickly and give good permanence on coated stocks, while maintaining excellent print quality and a dark image on non-coated stocks. It will give you the performance of the CM-557 on coated stocks, but with the print quality and density of the CM-903 on non-coated stocks. For matte, glossy papers & corrugated style substrates The Data Black is a dye- based ink that was designed to print on pharmaceutical boxes. It produces a high quality, scan-able image that dries well on regular and coated substrates. This ink provides adequate decap time and very little maintenance. For coated stock The best alternative for customers who need to print on coated paper. It gives an image that resists smudging on coated sheets. While there will be some smearing when the image is smeared with a wet finger, it will remain clearly legible. The image gets into the paper stock and therefore gives a more durable solution. For difficult substrates The MAX is a water/solvent based ink that prints on non-porous substrates, including Tyvek, PVC, varnish, polyvinyl, aqueous and plastic cards. 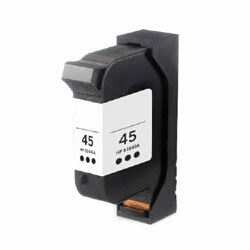 This fast drying ink produces a quality image that is smudge resistant on a variety of media. The MAX is flammable. MAX 2 & MAX 3 are non-flammable. Non-porous substrates, UV coat, foils The Bear ink is a solvent-based ink that will print on many difficult substrates such as foils, varnishes, and UV coated materials without the use of a dryer environment. 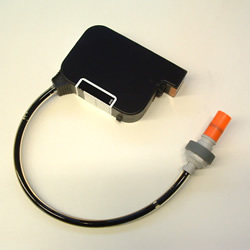 For optimal performance, firing voltage and fire pulse length settings will need to be modified. The Bear is flammable. For porous The CM-903 is a pigment-based ink that produces a high-quality image on porous substrates. This ink is good for bar codes and other applications that require a very high quality image. 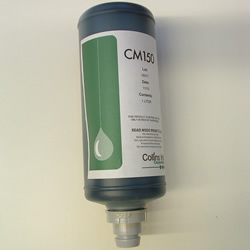 For coated or non-coated stock The CM-631 is an invisible ink that is only visible under an ultra violet light. This ink can be used on both offset and coated stocks. The invisible ink is great for security and insert/envelope matching applications. For coated or non-coated stock The TWW-1284 is an invisible ink that is only visible under infrared (R) light, and can be used for both coated and non-coated media. In addition to the variety of customized ink solutions, Sermar also offers cyan, magenta and yellow pigment-based ink formulations and 14 standard colour dye-based formulations. Sermar can also colour-match virtually any Pantone Matching System (PMS) colour. The inks are available in cartridges or bulks. All standard colours are available in “Fast Dry” and Heads Up” formulations.